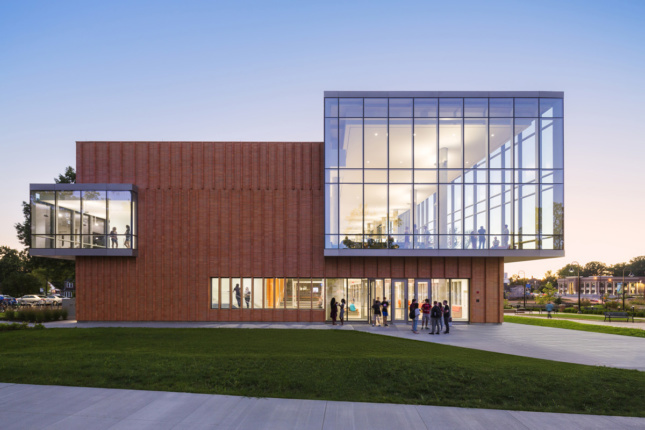 New York City–based WEISS/MANFREDI has designed a new center for Kent State University’s design disciplines. The project was inspired by strong urbanist principles, beginning with the desire to connect the university with nearby downtown Kent. Marion Weiss, co-founder of WEISS/MANFREDI, said of the connection, “The city and the university have gotten together with a revolutionary plan to make a strong link between these two destinations.” To achieve this, the architects located the 117,000-square-foot structure along a primary east-west pedestrian esplanade, subtly canting the orientation of the building to maximize a perspectival effect of the corridor. A continuous gallery anchors the building’s ground floor, along with a café, gallery, library, 200-seat multi-purpose lecture room, and classrooms to support a broad range of activities on the main level. Above, an expansive 650-seat “design loft” forms the heart of the building’s program alongside an ascending sequence of critique spaces. This open studio concept encourages the mixing of classes, where various disciplines and experience levels can brush up against one another. 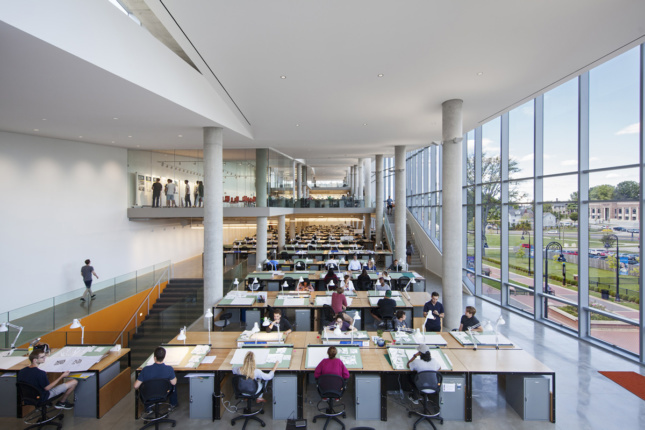 The architects’ efforts to produce an open learning environment were realized through a reinforced concrete structural system that maximized floor to ceiling heights, long spans, and a durable exposed concrete slab ideal for a workshop environment. 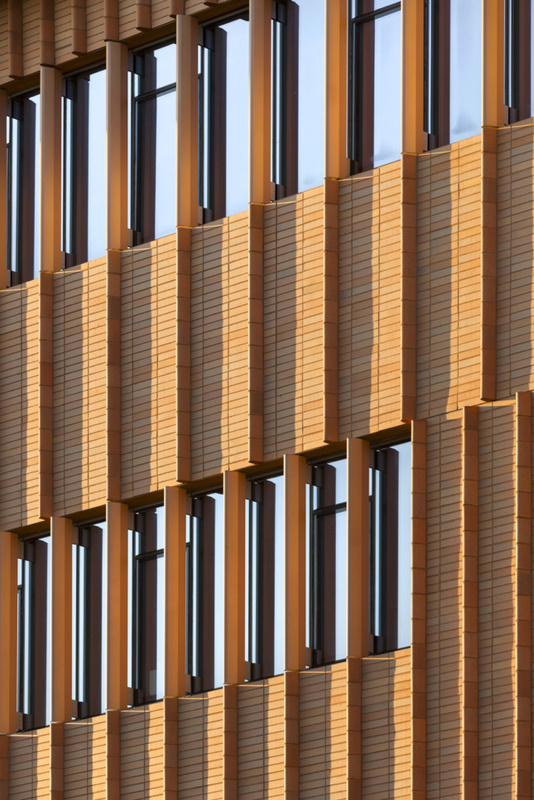 The facade is composed of full-size norman bricks installed as a single-wythe brick veneer. This assembly is constructed as a cavity wall on metal studs with brick anchors coordinated with the coursing. A predominant feature of the facade is the use of custom, asymmetrically bull-nosed bricks that establish a rhythm along the lengthy building. The fins project a maximum of 4-inches from the facade, a dimension regulated by the structural coursing of the brick units. Anything greater than this would have required additional metal angles. Where these fins pass over window openings, a custom aluminum extrusion with a specular resin finish was specified. This allowed the composition of the facade patterning to operate irrespective of punched ribbon window openings. The spacing of these fin elements are compositional and coordinate with designed control joints and required weeps in the brick facade. The overall pattern and scheme was designed to respond to the building’s glass curtainwall and cantilever conditions. An example of this can be seen on the south and north façades where the pattern is densified in proximity to the most extreme cantilevers to gain an added shadow/light effect. The architects said it was important to the design to slip the fins at floor levels to indicate a scale to the building and to provide a level of animation to the facade.